How often do you think about your front door? I bet it’s not all that often … and that’s a pity because the front door to your house is important. Besides being the gateway to your home, it helps provide the first exclamation mark of the entry procession. When thinking about a front door, there are certain self-evident objectives that should be met – things like security (both real and perceived), protection from the weather, warm and inviting (hopefully – although maybe this isn’t always desired) reception point. I am not going to focus on the obvious objectives that your front door serves – I think that would be like me telling you not to touch a hot pan or you will get burned. You should know most of these items well enough already, so instead I am going to focus on the visual aspects of a front door, and I am going to use a door that we are currently building as the example of what can happen when you have some fun. The plan above shows the floor plan of the front door of a house I currently have under construction. The architectural style would be described as transitional (something between modern and traditional) and we have a really clean palette of materials. I have shown the path of the door swing in blue so that it might be easier to see that this door is not hinged along one side, but rather pivots along a point approximately 12″ in from one edge. This is called a “center hung pivot hinge”, which basically means that the pivot point is centered along the center of the door thickness. Hinging a door in this way can allow for an extremely wide door – 5′-7 1/2″ wide in this case – to be a bit more manageable to control. And let’s be honest, it also makes for a much cooler door. This was our first iteration of the front door – large steel frame, wood panel insert, clear glass for viewing running vertically along the thickened steel edge that will eventually contain all the mechanisms associated with the door hardware. There is also a two-foot tall glass transom above the eight-foot tall door. 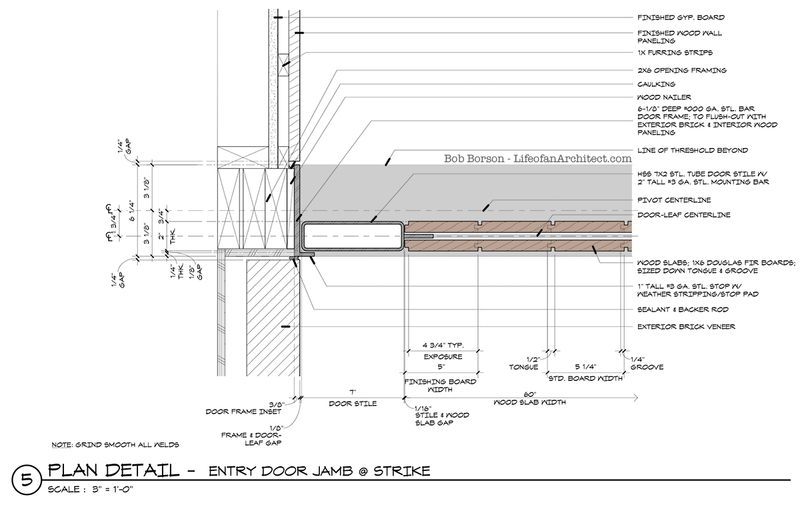 I should point out that I took our construction drawings into Photoshop and added some color so that it might be a little bit easier to see what’s what. 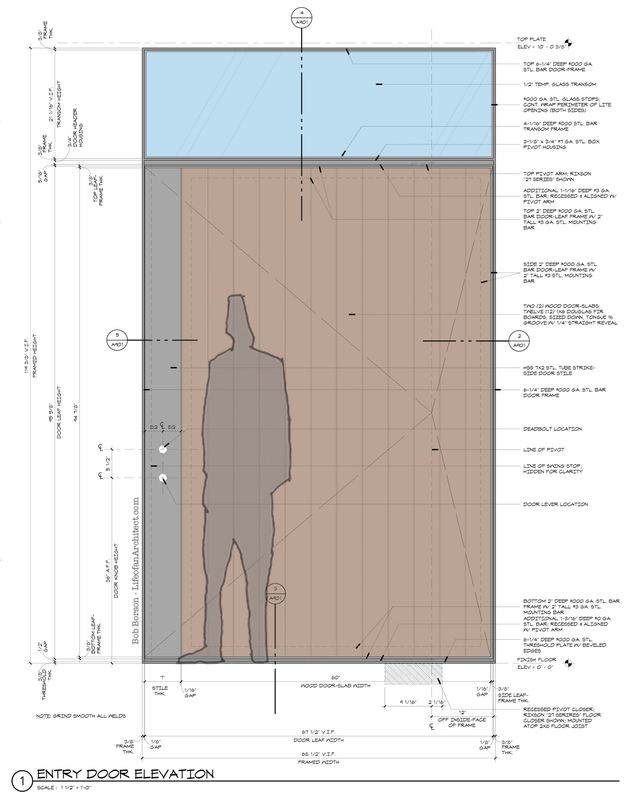 The gray is steel, the glass is rendered light blue, and the wood is shown as brown. Easy-Peasy, just for you. I’ve always wondered if there were some sort of individual characteristic that I could discern by the individuals that fall into each camp … do the people who don’t want to see out walk around in their underwear a lot? Maybe the people who like windows in their front walk around in their underwear a lot … but they don’t care if you see them or not. In either case, these particular clients did not want a window at the front door and I was more than happy to oblige them because I am also a “don’t need see out the front door” type of person. Or maybe I walk around a lot in my underwear? You’ll never know. This is my actual front door and I’ll confess that I don’t walk around a whole lot in my underwear but I DO dance a lot right in front of this door and if you’ve seen my ridiculously amazing dance moves, I quite sure that the rest of the neighborhood would really like for me to have a glass vision panel in it so that they could get a free show every now and then. So this is the updated front door after the glass panel removed. If you look at the drawing above, I thought I should point out the 4 dashed lines that are running at a diagonal – sort of like a really off-balanced letter “X” pushed over to one far side. This is how we show which way the door opens. The lines converge on the edge where the hinge (or in our case) the pivot will be, and the far extreme points of the dashed diagonal lines indicate the extent of the door corners where it opens. (Hopefully, that makes sense, try explaining that one yourself – it’s a lot harder than you might think). This entry door isn’t just something that you can run down to your local big box and pick up – nor should it be. One of the great things about designing residential projects for specific clients is that you can really get in and explore the opportunities to deliver a superior product that exceeds expectations. IN the image above, you are looking at what would be considered the “hinge” side jamb detail. We are trying to make the door take up the entire width of the entry hall and this means reducing the frame that contains the door to the bare minimum. We are able to accomplish this visual “minimization” by embedding the steel frame into the wall and making the finish materials flush out with the edge of the frame. All that is left exposed to the exterior is the 3/8″ painted steel frame. 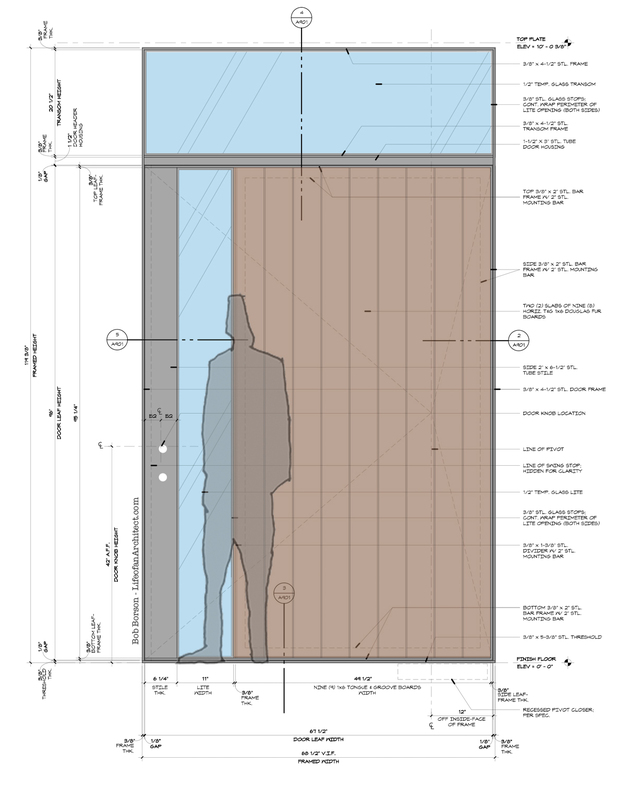 If you really want to look closely, there is a 2″ x 3/8″ steel panel that sits within the 3/8″ perimeter frame. It is this internal steel frame that the wood will attach AND keeps the front door secure … nobody is casually kicking this door down. The front door to your home can set the tone and expectation for the rest of your home. If you pay attention to the little things at the very first moment that someone comes to your home, it stands to reason that you will pay attention to those same type of details throughout the rest of your home. 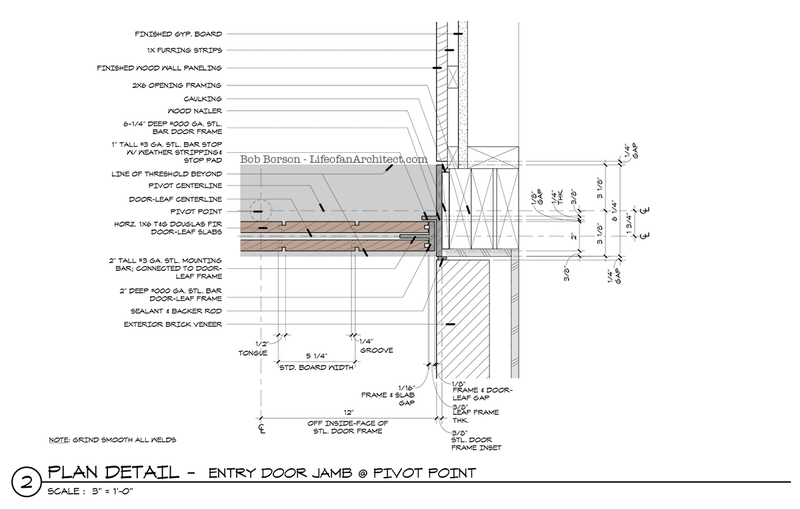 There are about 4 more details that are truly needed to properly execute the design of this door – and I know that there are a few things that will need to be evaluated once we deliver these drawings to the steel fabricator. But that’s okay. One of the very best aspects of being an architect and getting to work on the sort of projects that come into my office is getting to constantly reinvent the wheel and take a look at personal experiences that will enrich the process for the people for whom I am working. This door will be a point of pride for everyone who is involved – going through a door like this will be an experience and will be something that people will talk about.